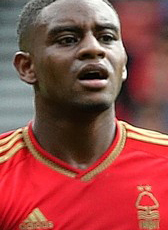 On 20 August 2015, Ebecilio joined Championship side Nottingham Forest on a season-long loan from FC Twente. Nottingham Forest has an option to buy Ebecilio after the 2015-16 season. During winter break 2015-16, he decided to return home to sign for ADO Den Haag on loan for the rest of the season. Ebecilio played only five times for the English side in the beginning of his loan period. He participated in Den Haag also for just six matches before returning to Twente in June 2016. In March 2017 his contract was terminated.